"In the ambulance I said, ‘You need to get a substitute to Laurelhurst Elementary for tomorrow,'" the injured teacher recalled. A suspect identified as Tad Michael Norman allegedly shot the teacher in an attempted carjacking, then opened fire on a bus, and then fatally shot another driver and killed another man in a head-on collision, police have said. Police said the violence that occurred just after 4 p.m. when the suspect emerged from his home with a handgun appeared to be random. Authorities have not described any possible motives. Deborah Judd, 56, a teacher at Laurelhurst Elementary School, said the gunman was in the middle of the road and fired through her windshield, striking her in the arm, the shoulder and lung, and he did not say anything before opening fire. "I don't know why I was the lucky one, but I also don’t know why somebody stepped out in the street and just shot me on that nice little road," Judd told reporters in an interview at Harborview Medical Center on Thursday. In the ambulance, Judd said her thoughts were with her students. "I love my second-graders and I'm worried about them," Judd said. "And in the ambulance I said, 'You need to get a substitute to Laurelhurst Elementary for tomorrow.'" "I want to make sure that the kids know I'm OK, and I'll be back soon, and I love them," Judd, who has been teaching for 30 years in Texas and Washington state, said. "And I know how scary it is for them." Seattle police Deputy Chief Marc Garth Green said Wednesday evening that "some type of issue" with the suspect, "either maybe mental health or substance abuse or something along those lines may have triggered this." Norman, 33, was released from the hospital and was being held without bail Thursday on initial charges of homicide, robbery and assault, according to online jail records. The case is still under investigation and charges could change. He is expected to have a first court proceeding on Friday, the King County Prosecuting Attorney's office said. The names of the two people killed have not been released by police. Authorities say the gunman, after shooting Judd, opened fire on a bus and wounded that bus driver, and then fatally shot a man in a carjacking and fled in that victim's Prius, before crossing into oncoming traffic and striking another car head on, killing that driver. The bus driver, identified by officials as Eric Stark, has been hailed as a hero for backing up the large vehicle and moving it out of danger despite being shot. None of the passengers on the bus were injured. Stark told ABC’s "Good Morning America" on Thursday that his main concern was: "I've got to get these people out of here." "I did like a two-second assessment of my injuries, and figured, 'Well, I can breathe, I can think, I can see. OK, we’re getting out of there," Stark said on the program. 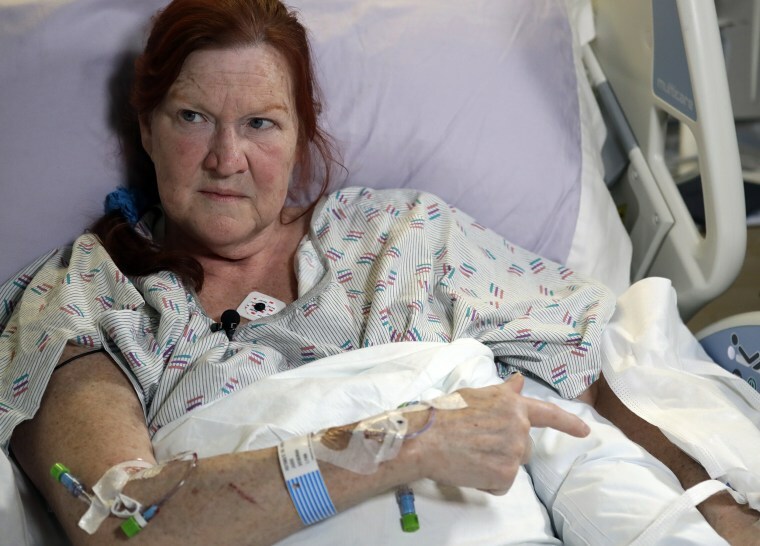 Judd said Thursday that she is doing well, although doctors have told her that the bullets will likely not be removed. "It's a little strange to think about walking around with pieces of shrapnel," Judd said. "And my family was joking: We have veterans in our family, and nobody's ever gotten shot," she said. "Generations of veterans. But the school teacher got shot." Judd said she had been thinking of getting a job closer to her home, and before the shooting had decided that the commute to her home in Snohomish, northeast of Seattle, was tiresome. "But I don’t know if I'll ever go back down that road again," she said.